I think that’s a record for me on this blog. I do have ambitions to eventually blog on it weekly if not every couple of days…someday when I start doing my own dying and making my own patterns. Someday when I’ll likely move to a different blogging service like wordpress and have my own domain name. So not today and likely not in the next year. But SOMEDAY. Another finished object under my belt. Despite making this roughly four times the size the pattern calls for, it was still a two day knit including felting and sewing it together. Unlike the bunny, this one has been much better received and is getting plenty of love. I didn’t do too badly trying to upsize it, could have made the legs a bit wider and longer; I think I did well on the ears and tail though. It’s tricky to upsize a pattern like this because not all pieces could be done to the same proportion as the body or else they’d be the wrong size for each other. Strange, but that’s how it worked. 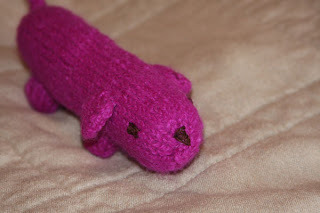 I have enough of the medium brown yarn left that I plan to pair it with some pink I have and eventually make a similar puppy for our little girl. In celebration of our new camera, I bring you new and improved FO pictures. At least they’re more color-accurate and I can use the fun tulip feature to get in closer so you can see details on my projects. Seriously, I haven’t read the manual for this thing yet and still managed to take wonderful pictures on my own. Cybershot, your days are numbered, my “friend.” I shall not settle for a yellowed out, washed out, too dark, too light, you-focused-on-something-that-was-not-the-subject, etc etc, picture again. Here they are, the previously mentioned Zombie socks in all their purple and black glory. (I love this colorway so much that I’m beyond a little tempted to purchase more of it and possibly in a larger quantity to make a tank top or light sweater of it.) 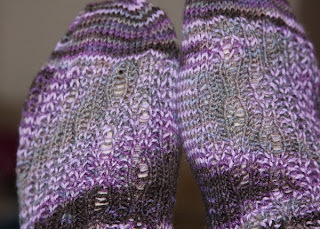 The drop-stitch pattern was fun and easy to do. Also easy to memorize. I would love to do it again in the future, maybe next time in BMFA STR Raven of some colorway. I think the stitch pattern would stand out better in a yarn with less varigation, but a nice hint of color. 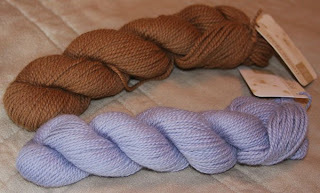 I can’t bring myself to use a true solid color yarn. This is the happiest I’ve been with a pair of socks I’ve made myself yet and I think I’m starting to get a really good feel for how to get a proper fit. I still have issues making my tension tight enough since I have this fear that ribbing isn’t going to stretch. Silly, I know. No pictures of my current project. 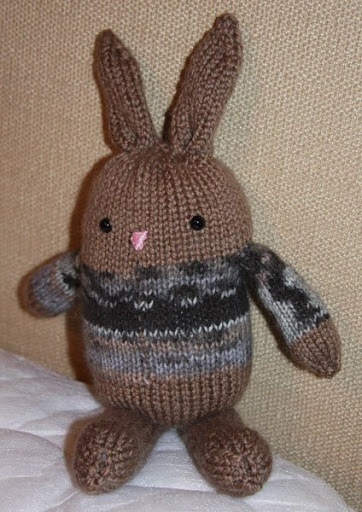 I’m making yet another Jelly Bean Bunny from one of the first patterns I ever purchased. I’d argue that three uses in just over a year is not bad for a $3 pattern. I keep coming back to it because it is so easy but so cute at the same time. (Unlike that putzy Sheldon. Grrr…I still can’t make another of those. Even thinking about it makes me twitch. Today I reasoned that by going up a needle size and using bamboo DPNs rather then nickel plated ones, he may not be so painful this time around and I can slightly upsize him.) I upscaled this pattern a bit to use some chunky weight yarn I’ve had sitting in my destash pile that no one seems to want to take off my hands. It matches perfectly with some tapestry yarn my MIL gave me that was left-over from a sweater she made DS. So, I’m making a manly little bunny for my bunny. There will likely be enough of both left over that DH has requested that he, too, needs a bunny. He seems to have some love for the homemade stuffed animals. In non-project news, the new Twist Collective online ‘zine was pointed out to me and WOW, is it impressive and pretty! It has taken me awhile to wrap my head around the idea that all the patterns are individually priced and have to be purchased as such, but it wouldn’t exactly be the first time I’ve purchased patterns that way from a specific designer’s site…so really, it isn’t much different. 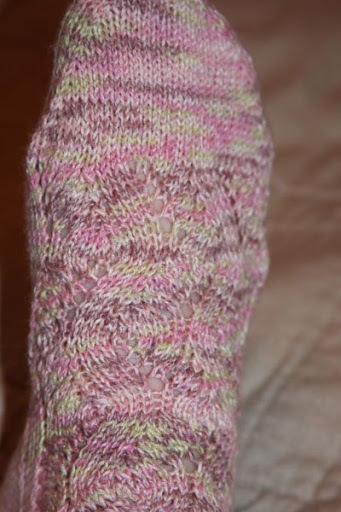 I for sure plan to purchase Pam Allen’s Come Together pullover as well as Cookie A’s Lissajous knee socks. There are a couple other patterns I’m debating purchasing, but I’m assuming they won’t take them down and I have time to decide for sure what I think and if I find it worth it to purchase. This ‘zine has by far impressed me more then the fall previews of magazines I usually enjoy. For instance, there will not be a Fall Rebecca, Vogue, or IK in my home–unless IK has some seriously fabulous articles in it. Fall Knitscene is fab, but that’s about it. Oh well, less to pile onto my queue from any of them. As if it needs to be flooded with tons more projects.